Are you trying to use LinkedIn for your business? Are you looking for strategies to attract more followers to view and share your posts? LinkedIn is the most important website for professionals. LinkedIn can provide enormous benefits to a business. With several social networking sites springing up every day, LinkedIn may seem to have lost its ground. However, the fact remains that LinkedIn is a very powerful platform which professionals, companies and businesses can make use of. If you wish to make the best of your account in LinkedIn, you can make use of the following steps. LinkedIn offers a large number of benefits to businesses. To begin with, LinkedIn is a professional playground. It is has three times more visitor to lead conversions than Facebook or Twitter. Users of LinkedIn have mentioned that they are more prone to make a contacting and using information from a certain company if they engage with that company on LinkedIn. You should ensure that the length of a post in LinkedIn should be within 500 to 1200 words. A longer post can sometimes result in the loss of interest which may have an adverse effect on the business. Therefore, you should be careful of the length of post. The shorter the length of the post the more interest it entails. Usually, LinkedIn users are known to check their profile during the weekdays, i.e. from Monday to Friday. There is an increased amount of traffic from 1pm-3pm and 5pm-6pm. These are prime times for engaging with other users. You should make sure that you post at least twenty updates every month. This can help you reach around 60% of the monthly unique audience in LinkedIn. An increase in the amount of posts will increase the exposure of your business. You should try to post more multimedia content. Positing such content will help you get more shares for the post. LinkedIn does allow sharing of videos and images. Images should be used in the post. After all, images tend to garner a higher number of comments. When links are provided in the post, it can increase engagement levels. Of course, the links provided should be related to the post and they must be informative. You can make use of keywords to increase the exposure of the posts. These should be words that connect the audience to the post. If the targeted audience is not able to relate to the post, it will become less interesting. In turn, you will end up losing a number of your followers and audience. The ultimate result will, of course, be a loss in your business. Therefore, use a few keywords to enhance the reach and exposure of the post. It is important for the keywords to be placed naturally otherwise they will end up making your post look silly. In the worst cases, they will be completely unreadable. 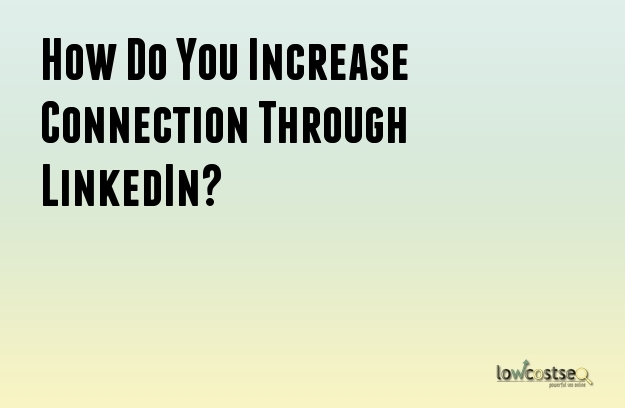 By making use of these tips, you can find it easier to increase the number of your connections on LinkedIn as well as the shares your post receives. Ultimately, it will be beneficial for your business as well.